Why Are Equities So Bid? HomeBusinessWhy Are Equities So Bid? U.S. retail sales fall for the three consecutive months. Chairman Bernanke disappoints the easy money crowd during his Congressional testimony. Weekly jobless claims come in much higher than expected. Companies miss big on the top line yet their stocks move higher. Sovereign yield curves in the European periphery moving toward inversion. Equities keep moving higher and higher. WTF? Nobody knows for certain and we’ve learned to run from those who think they do. Here are some of are our thoughts and observations of what is driving the markets. 1) Market was sold out. Trading the thee macro swans — Europe, China, and U.S. slowdown – caught too much fast money leaning the wrong way and real money under allocated to equites. A dearth of real sellers has forced the shorts to cover, bringing the major averages above technical levels that has now generated buy signals for the fast money crowd and convincing them the swans are priced. 2) Massive capital flows into the U.S.. The U.S. equity market is providing leadership for global equities. We don’t have the data x/dollar strength but we hear anecdotal reports of big money flows into the U.S., which generates even more liquidity in domestic markets. The flooding of the capital markets is “lifting all boats.” Kind of feels a bit like the environment after the Russian debt default in 1998 when the U.S. market was flooded with safe haven capital flows. 3) The Bernanke Put. Markets know that the Fed will be there to backstop any large equity sell-off and feel more confident about buying risk assets. 4) Swan fatigue. Investors and traders are tired of being negative about Europe and worried of a China hard landing. They are now picking up U.S. stocks, where earnings appear to be holding up better than expected. They assume a fiscal deal gets done in Washington. 5) Positive long-term prospects for the U.S.. Last week’s Economist had a very positive article on the long-term prospects for the United States, titled The Comeback Kid. They note the healing in the housing market; an expanding export sector; and a structural upgrade in U.S. competitiveness due to the exploitation of shale gas. Thus, the “bullish on America” trade is back. 7) Romney polling better than expectations. The latest NYT/CBS poll shows the President and Governor Romney in a dead heat. In our opinion, the equity market would rally on the perception of a Romney victory. 8) All of the above. This gets our vote. Whatever the reason(s) for the equity market strength the question is – is it sustainable and healthy price action? We don’t know and think of an analogy from NASA’s finest moment. Did anyone think Apollo 13 could make it back to earth just after it blowing out the oxygen tank which crippled its service module? Many didn’t at the time and much had to go right. So to it is with equities right now. We respect the price action, acknowledge our ignorance, afraid of being too long, are almost always intellectually bearish, have been ground up in the choppy action, and think the market is range bound. A close above 1375 on the S&P500 ratchets up the new range to 1375-1415. 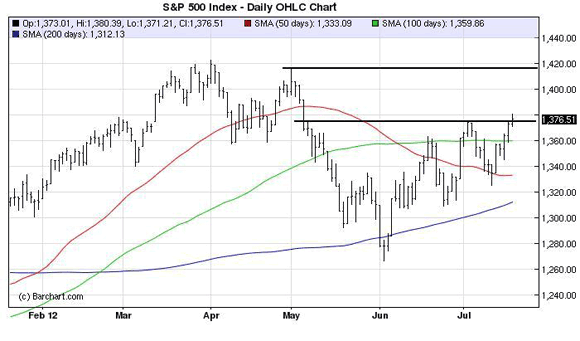 The market moves fast on news so we view must hold support at 1360, the 100-day moving average. There you have it, folks, our interpretation of the shadow puppets dancing on the side of the market cave!